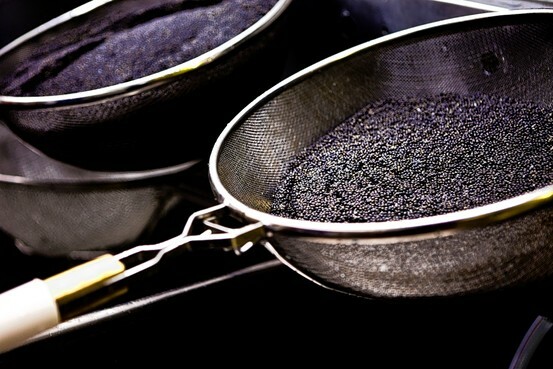 Freshly harvested caviar at Sterling Caviar farm near Sacramento, Calif. The new caviar country is located six hours north of Los Angeles and an hour and a half east of San Francisco. It's a 60-mile stretch of lush, grassy, stream-crossed plains spanning from the Sacramento-San Joaquin Delta to the Sacramento Valley. The region now produces an estimated 85% of all the white sturgeon caviar in the U.S., including the creamy, crystalline dollops served in A-list eateries such as The French Laundry, Per Se and Nobu. "Throughout the history of caviar consumption, the Caspian Sea has been the Champagne region of the industry," Mr. Carey said. "But the Sacramento Valley is establishing itself as the new center of it all." There are five "aqua farms" in the region, two actual caviar producers: Sterling Caviar and Tsar Nicoulai. Sterling is the larger of the two, producing 12 tons of caviar per year—its tanks churning with 2.5 million gallons of freshwater. Sterling appears to be winning the game, having nabbed an exclusive partnership with Petrossian. Sounds like a nice day trip from the Bay Area. The Sacramento River has long had sturgeon, huge suckers, some over 12 feet. They can be caught on a hook, not much fight to them, fishermen say it is like reeling in a telephone pole, but not so good for caviar. Caviar has always tasted like fish eggs to me.